We shape our dwelling, and afterwards our dwellings shape us. Having lived in apartments—both here in the U.S. and abroad—most of my adult life, I used to think of home as a house I’d one day have, decorated in a rustically chic and understated sort of way. In my home, I imagined busying myself with creating a comforting nest, replete with simple, yet creative touches that would add texture and depth to an otherwise ordinary room. Now, however, I think more of the concept of home, rather than its structure. Home, for me, is no longer that house. Instead, it’s the life that is breathed into the small and large spaces to create room for love, laughter, solitude, companionship, and comfort. In thinking of the meaning of home, I often think of the warm sense of well-being the Danes call “hygge“, which means creating a cozy atmosphere and enjoying the good things in life with friends and family around you. It’s also the experience of sitting around a table for hours eating, drinking, discussing life—the big and small things. The Danish idea of hygge explains why the Danes are often considered the happiest people in the world. I recently read an article that said a house is simply a geographic location, a street address, whereas a home is where, and with whom life happens. In my first apartment in Korea, home was heated floors and very attractive sliding wood doors. In Guam, it was the beautiful beach. In California, it was an apartment with French doors and a brightly colored wall that made me feel as if I was on vacation. Now, home for me is more than the structure that provides me warmth and comfort. Home is the sound—the giggling and singing—of my two-year old’s voice filling the air. It’s the sweet music I hear from another room—his dad putting him to bed while singing in French, and off-tune, to a bed-time song he made up: “Fais dodo, fais dodo, mon petit bébé, fais dodo, fais dodo, mon petit garçon…” Home is no longer a structure, it’s an environment where life grows. I’ve been fortunate to experience the feeling of home, even while not at home. I wrote about them in Talking Timbuktu in Buenos Aires and Ithaka: Finding Home. Another time was many years ago, when I had paella for the first. As a vegetarian, I preferred to pass on the rabbit and/or seafood filled paellas that had come my way, but this time it was a vegetable paella. I was visiting France and staying with a friend who lived with her parents in a small town. Her parents, known to be very welcoming and friendly people often opened their home to people—colleagues, friends, students, their children’s friends, visitors, etc. 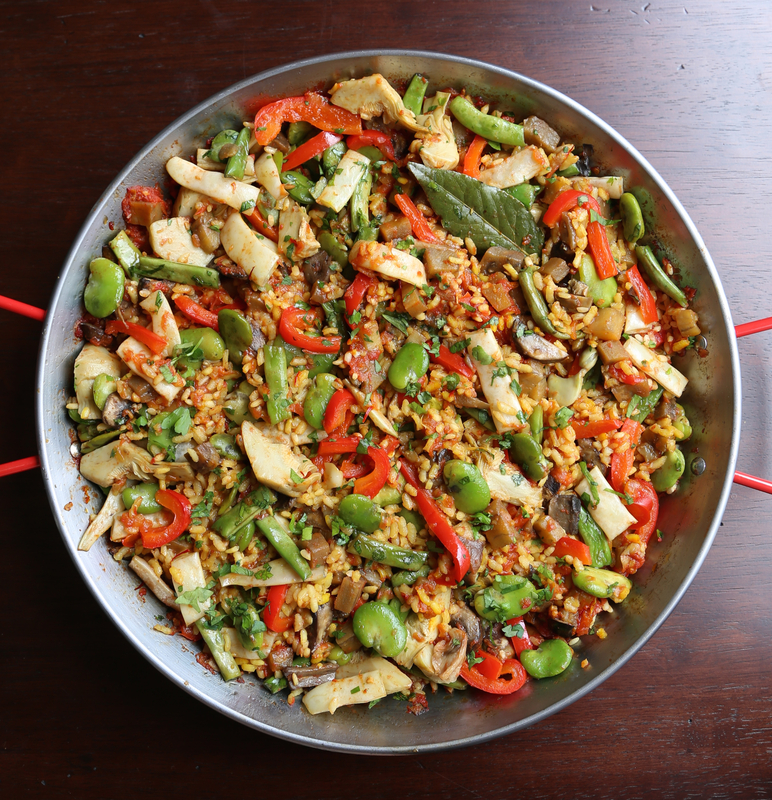 One evening, while staying at their home, there were a lot of guests (an eclectic and international group of people young and older) over and my friend’s mother had made a large pan of vegetarian paella. I can’t say that I remember all the people present, or the vegetables that went into that paella, but I do remember that evening and the cozy feeling I had being in that room. It was summer time, and I watched as her mom brought life into the room, talking to everyone as if we were all part of the family, as if we all lived there. With effortless charm, she made it seem as if it were completely normal that we’d be there that evening, eating dinner with her family, like a typical evening of any week. I didn’t know it then, but the Danish art of hygge was certainly present in the house; I felt like I was at home. Every time I come across paella, I’m brought back to that wonderful summer evening in France. My friend’s kind and beautiful mother has since passed away. I made this paella thinking of her and how she created home for a traveler like me. In a 14-to 16-inch paella pan, over medium heat, heat 4 tablespoons oil. Add eggplant and cook for about 2 minutes. Add bell peppers and cook for about another three minutes, until eggplant is browned and peppers are just softened. Remove from heat and transfer to a plate. Add about 2 tablespoons oil to the pan and add the green and white beans, and fava beans. Cook for 3-4 minutes. Transfer to a plate and set aside. Lower the heat to medium and add tomatoes, garlic and salt and cook until the tomatoes have darkened, about 10-15 minutes. Meanwhile, heat a little oil in a small sauté pan over medium heat. Add garlic, mushrooms and salt. Cook about 5 minutes. Set aside. Add the bay leaves, pimentón, cayenne pepper, and saffron to the tomatoes. Allow the flavors to meld together, stirring constantly. Add eggplant and bell peppers, then add the stock to the pan. Bring to a boil. Taste for salt and adjust seasoning. Carefully add the rice, distributing it evenly in the pan. Do not stir. Cook uncovered for about 10 minutes, then reduce the heat and cook for another 10 minutes, or until the liquid is absorbed and the rice is cooked. Remove the paella from the heat. Taste and without stirring, adjust seasoning as needed. 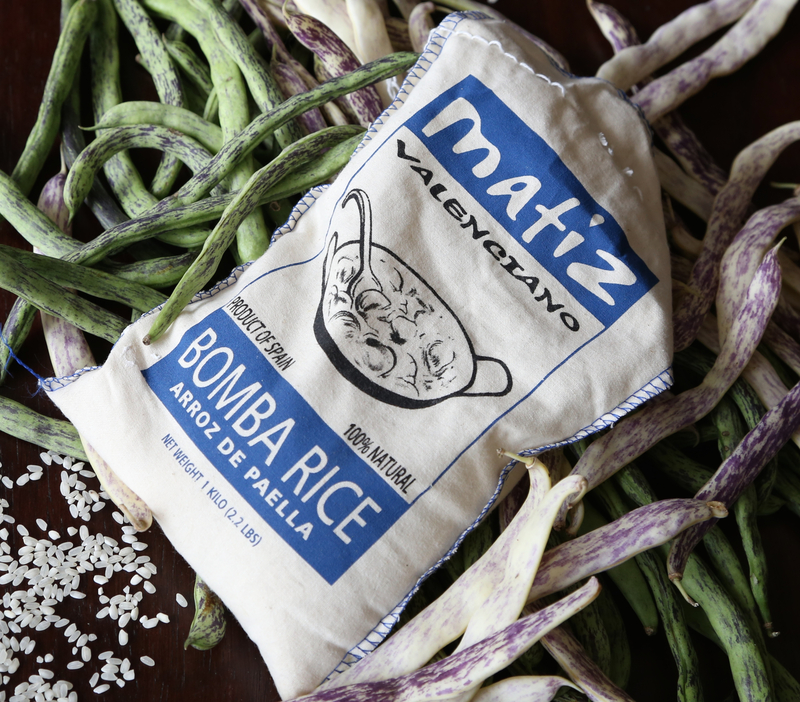 Distribute the green and white beans, fava beans and artichokes over the rice and cover the pan with foil. Allow to rest for about 5 minutes. Remove the foil and serve. * To easily remove the skins off shelled fava beans, soak them in boiling hot water for about a minute. Drain and allow to cool. Squeeze each bean gently to remove the skin. Discard skins. ** Last week I picked up Rattlesnake (green and purple) and Dragon Tongue (white and purple) beans at the market so I used them, but any been bean will do. If you can’t find white, just use green beans and there’s no need to double the amount of green, if you’re not adding the white. ***I chose to grate my tomatoes with a box grater, for a smoother consistency of tomatoes. If you choose to go this route, cut the tomato in half, crosswise. Use your finger to scrape the seeds out. Cupping the tomato in your hand, slowly grate. The skin, which you can discard, will gradually peel back as the flesh of the tomato is grated. **** I so wanted to use fresh artichokes for this recipe, but I need to learn how to cook with the fresh stuff. The first time I made paella I tried cooking it with fresh artichokes and well, it was one tough mess. Long story short, it was inedible and I had to painfully pick out all the strips or artichoke that I had cut and added to my dish. Lesson learned. Now I used them from a jar. The ones I used were marinated and packed in oil. I was afraid they’d add an unwanted flavor to my paella so I rinsed them before adding them to the paella. Thank you Fae. From one spectrum of life to another, as our hearts change and grow, so do our feelings of home. Heart and home, they are inextricably linked. Love to you. This looks wonderful. I love paella. This is such a home dish. I agree that a house is not automatically a home. Home is where you feel loved and known and that can be wherever your heart is. Insightful as always. Thanks Amanda. I think the concept of home evolves to richer meaning as we grow in wisdom and learn to value the beauty in the simple (yet awesome) things we sometimes don’t always appreciate, like the gift of feeling loved and known, as you say. Thanks much for your comment. It’s appreciated. Merci Martine pour ce joli texte et cette merveilleuse recette! Mon grand-père descend d’un marin danois arrivé à Tahiti. Ma mère s’appelle Brodersen. Ceci explique aussi peut-être cela! 😉 Continue de nous régaler. Bienvenue Audrey! Je garde de bons souvenirs de ta mère. Je t’embrasse très fort! I bought some colorful peppers from the market this morning. Now that I saw your post, I will probably use them for a paella!!! Thank you!!! Great! I love paella. Such a festive looking dish. The colorful peppers will be lovely. Hi Ngan, thank you for your comment. I’m so glad you enjoyed the post and yes, next time on the beans! I too had never used them before. When I saw them at the market I had no idea what to do with them, and then voila, this paella came together. 🙂 The farmer I purchased them from said that one of these (Unfortunately I can’t remember if it was the Rattlesnake or Dragon’s Tongue) were his favorite of all beans and he even eats them raw! I also ate them steamed, as a side dish with other vegetables, with a little olive oil and salt. 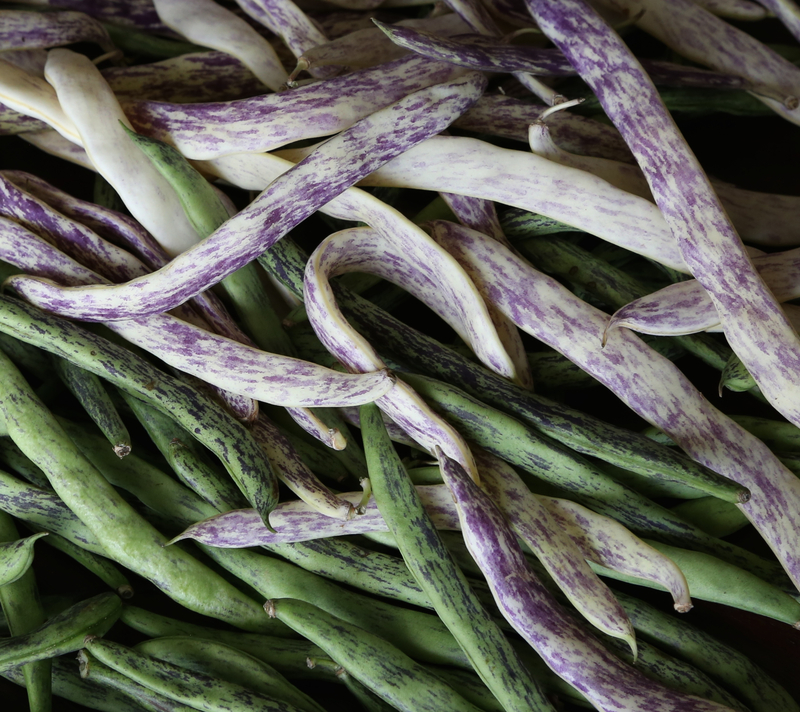 It’s too bad their interesting purplish color goes away when cooked, but still an interesting bean to try.